Explorer 1 in orbit - simulated in Kerbal Space Program. Image credit: Bob Trembley. Sixty years ago next week, the hopes of Cold War America soared into the night sky as a rocket lofted skyward above Cape Canaveral, a soon-to-be-famous barrier island off the Florida coast. The date was Jan. 31, 1958. NASA had yet to be formed, and the honor of this first flight belonged to the U.S. Army. The rocket's sole payload was a javelin-shaped satellite built by the Jet Propulsion Laboratory in Pasadena, California. 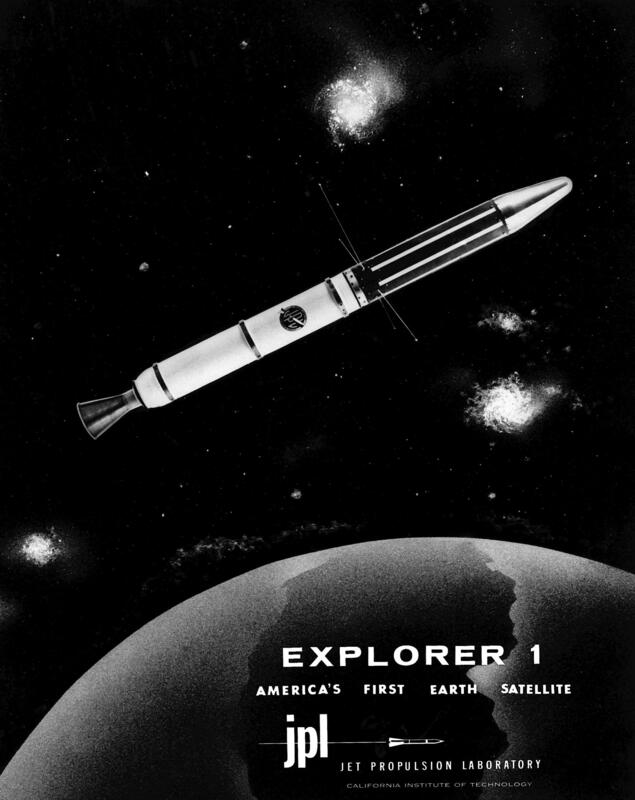 Explorer 1, as it would soon come to be called, was America's first satellite. Against the backdrop of the 1950s Cold War, after the Soviet Union successfully launched Sputnik, Americans were determined to launch their own Earth-orbiting satellite. Flash back to events leading up to the successful launch of America's Explorer 1, and the beginnings of America's Space Age, as told through newsreel and documentary clips of the time. "The launch of Explorer 1 marked the beginning of U.S. spaceflight, as well as the scientific exploration of space, which led to a series of bold missions that have opened humanity's eyes to new wonders of the solar system," said Michael Watkins, current director of JPL. "It was a watershed moment for the nation that also defined who we are at JPL." In the mid-1950s, both the United States and the Soviet Union were proceeding toward the capability to put a spacecraft in orbit. Yet great uncertainty hung over the pursuit. As the Cold War between the two countries deepened, it had not yet been determined whether the sovereignty of a nation's borders extended upward into space. Accordingly, then-President Eisenhower sought to ensure that the first American satellites were not perceived to be military or national security assets. In 1954, an international council of scientists called for artificial satellites to be orbited as part of a worldwide science program called the International Geophysical Year (IGY), set to take place from July 1957 to December 1958. Both the American and Soviet governments seized on the idea, announcing they would launch spacecraft as part of the effort. Soon, a competition began between the Army, Air Force and Navy to develop a U.S. satellite and launch vehicle capable of reaching orbit. At that time, JPL, which was part of the California Institute of Technology in Pasadena, primarily performed defense work for the Army. (The "jet" in JPL's name traces back to rocket motors used to provide "jet assisted" takeoff for Army planes during World War II.) In 1954, the laboratory's engineers began working with the Army Ballistic Missile Agency in Alabama on a project called "Orbiter." The Army team included Wernher von Braun (who would later design NASA's Saturn V rocket) and his team of engineers. Their work centered around the Redstone Jupiter-C rocket, which was derived from the V-2 missile Germany had used against Britain during the war. JPL's role was to prepare the three upper stages for the launch vehicle, which included the satellite itself. These used solid rocket motors the laboratory had developed for the Army's Sergeant guided missile. JPL would also be responsible for receiving and transmitting the orbiting spacecraft's communications. In addition to JPL's involvement in the Orbiter program, the laboratory's then-director, William Pickering, chaired the science committee on satellite tracking for the U.S. launch effort overall. Explorer 1 stage separation and ignition of solid rocket motors - simulated in Kerbal Space Program. Image credit: Bob Trembley. The Navy's entry, called Vanguard, had a competitive edge in that it was not derived from a ballistic missile program -- its rocket was designed, from the ground up, for civilian scientific purposes. The Army's Jupiter-C rocket had made its first successful suborbital flight in 1956, so Army commanders were confident they could be ready to launch a satellite fairly quickly. Nevertheless, the Navy's program was chosen to launch a satellite for the IGY. University of Iowa physicist James Van Allen, whose instrument proposal had been chosen for the Vanguard satellite, was concerned about development issues on the project. Thus, he made sure his scientific instrument payload -- a cosmic ray detector -- would fit either launch vehicle. Meanwhile, although their project was officially mothballed, JPL engineers used a pre-existing rocket casing to quietly build a flight-worthy satellite, just in case it might be needed. The world changed on Oct. 4, 1957, when the Soviet Union launched a 23-inch (58-centimeter) metal sphere called Sputnik. With that singular event, the space age had begun. The launch resolved a key diplomatic uncertainty about the future of spaceflight, establishing the right to orbit above any territory on the globe. The Russians quickly followed up their first launch with a second Sputnik just a month later. Under pressure to mount a U.S. response, the Eisenhower administration decided a scheduled test flight of the Vanguard rocket, already being planned in support of the IGY, would fit the bill. But when the Vanguard rocket was, embarrassingly, destroyed during the launch attempt on Dec. 6, the administration turned to the Army's program to save the country's reputation as a technological leader. Explorer 1 stage separation and ignition of second set of solid rocket motors - simulated in Kerbal Space Program. Image credit: Bob Trembley. Unbeknownst to JPL, von Braun and his team had also been developing their own satellite, but after some consideration, the Army decided that JPL would still provide the spacecraft. The result of that fateful decision was that JPL's focus shifted permanently -- from rockets to what sits on top of them. The Army team had its orders to be ready for launch within 90 days. Thanks to its advance preparation, 84 days later, its satellite stood on the launch pad at Cape Canaveral Air Force Station in Florida. The spacecraft was launched at 10:48 p.m. EST on Friday, Jan. 31, 1958. An hour and a half later, a JPL tracking station in California picked up its signal transmitted from orbit. In keeping with the desire to portray the launch as the fulfillment of the U.S. commitment under the International Geophysical Year, the announcement of its success was made early the next morning at the National Academy of Sciences in Washington, with Pickering, Van Allen and von Braun on hand to answer questions from the media. Orbit of Explorer 1 - simulated in NASA Eyes on the Solar System. Image credit: Bob Trembley. 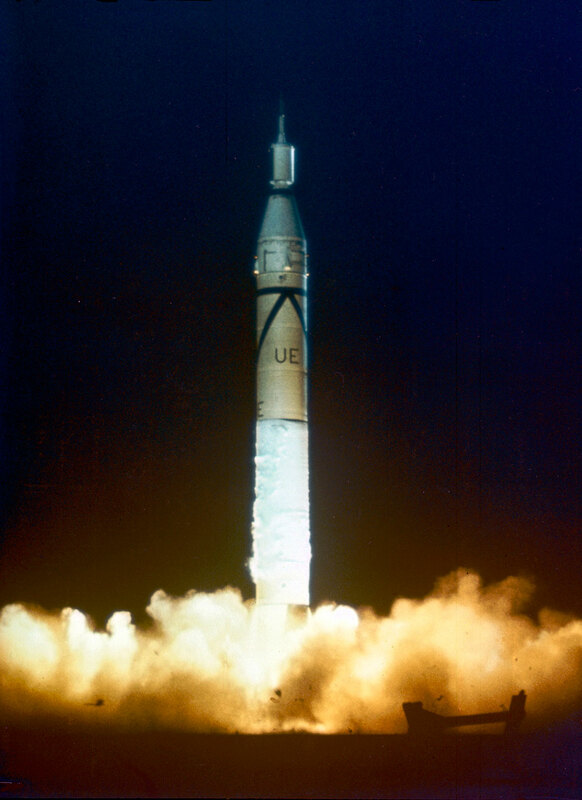 Following the launch, the spacecraft was given its official name, Explorer 1. (In the following decades, nearly a hundred spacecraft would be given the designation "Explorer.") The satellite continued to transmit data for about four months, until its batteries were exhausted, and it ceased operating on May 23, 1958. Later that year, when the National Aeronautics and Space Administration (NASA) was established by Congress, Pickering and Caltech worked to shift JPL away from its defense work to become part of the new agency. JPL remains a division of Caltech, which manages the laboratory for NASA. The beginnings of U.S. space exploration were not without setbacks -- of the first five Explorer satellites, two failed to reach orbit. 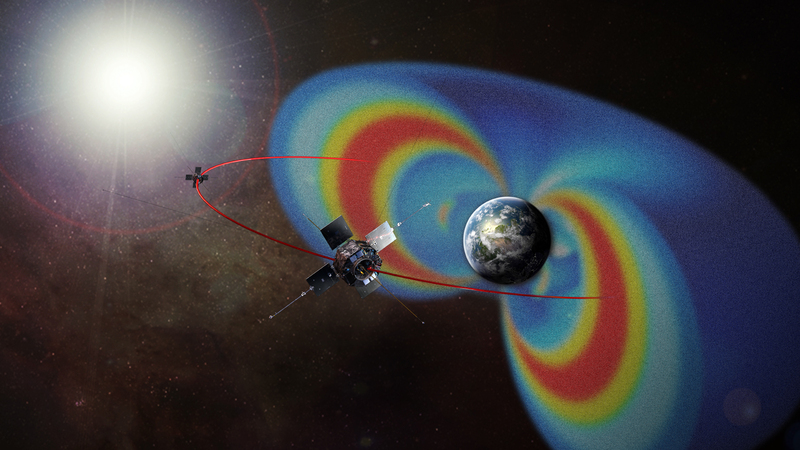 But the three that made it gave the world the first scientific discovery in space -- the Van Allen radiation belts. These doughnut-shaped regions of high-energy particles, held in place by Earth's magnetic field, may have been important in making Earth habitable for life. Explorer 1, with Van Allen's cosmic ray detector on board, was the first to detect this phenomenon, which is still being studied today. In advocating for a civilian space agency before Congress after the launch of Explorer 1, Pickering drew on Van Allen's discovery, stating, "Dr. Van Allen has given us some completely new information about the radiation present in outer space....This is a rather dramatic example of a quite simple scientific experiment which was our first step out into space." Explorer 1 re-entered Earth's atmosphere and burned up on March 31, 1970, after more than 58,000 orbits. Explorer 1 reentry into the atmosphere - simulated in Kerbal Space Program. Image credit: Bob Trembley. Much of this story is adapted from the JPL-produced documentary, "Beginnings of the Space Age: Explorer 1." Thanks for this! The launch of Explorer 1 is the earliest memory I have of a news event. (I was not quite 6 years old.) I can still see in my mind’s eye the headlines in The Arizona Republic above the very same photo of the lauch that you included in this post (in black and white, of course). The newspaper published the time when it would be visible overhead, and my whole family stood out in the back yard that night to catch sight of the satellite. I downloaded the last version of Stellarium but was unable to do that. Which command did you use? Hit F4 and look to the far-right, click on the globe with the text Surveys. I did, but nothing appears on the screen: should I enable some feature? I did it: I had left the old config.ini file. After reinstalling it they appeared!